If you can understand this, and apply it, you will rank. It is remarkable the number of changes in Google. Generally people are slow to catch on. But it’s actually easier to rank now than ever. You just need to play by the rules. Today, it’s not just about backlinks and anchor text. Let me demonstrate with a quick case study. Many times big websites share pdfs, whether they be online bills or user guides or whatever, they often put a link to Adobe “To download Adobe Reader, click here” – with a link to Adobe Reader. For years, if you Google’d “click here” the #1 result was Adobe. That’s because backlinks with Anchor text USED TO BE the best and most important ranking factor. It used to be essential that you had plenty of backlinks with the anchor text (the “anchor text” is just the set of words that when you click on them take you to the link). And you wanted the anchor text to be the key phrase that you intended to rank for. It is still an important factor, to have some backlinks with anchor text that you want to rank for, but these need to be small in number to avoid what’s called a Penguin penalty. See that result which is number 1? An authority site, with an article all about using “click here” as anchor text. It’s a really useful, informative, article. 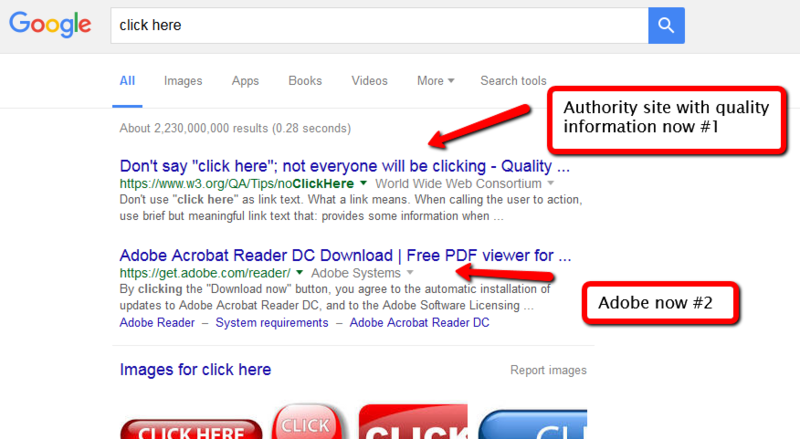 Let me ask you this: how many backlinks to that #1 result have anchor text “click here” do you think? According to Majestic – just TWO. And a TOTAL of just FOUR backlinks in total. Yet Adobe is ranked #2. And Adobe is also a site with huge authority. And over 600 backlinks saying click here. But ranked number 2 to a site with just two anchor text backlinks…. wow!!! Google is ranking that number 1 site for good reasons – on-site reasons. Backlinks are still important, and anchor text is important (keep it varied and natural). But unless you can show Google your page is highly relevant to the phrase you want to rank for, you are going to find it tough to rank. How Do We Achieve This So We Rank Too? First, good quality content with relevant related words that will cue Google to the topic. We’ve taught you how to achieve this relevance in our SEO Breakthrough webinars. But you’ve got to get plenty of good quality, highly relevant content, preferably media rich (images and/or videos embedded). And you also have to get your technical layout right. One of those areas is Schema. Now Schema is a reasonably complex micro data that is inserted in the HTML. The purpose is to provide the search engines with added information about your site so that they can better understand your content. As you help Google (and the others), they reward you with better rank and a higher visibility in the SERPS. Google, Bing, and Yahoo all support and encourage Schema, and sites that use Schema structure in their HTML will rank better “like for like” than a site that doesn’t use Schema. The trouble is, Schema it is complex. You can either hire a coder, or, fortunately, there are plugins that make the job easier. Either way, on page optimization, including use of Schema markup, and making your page highly relevant, is more important to ranking today than ever before. Be sure to focus on getting it absolutely as good as you can! I heard Schema was essentially only beneficial for local sites. Hi Ron – that’s not correct, no. It is beneficial for all SEO. This is a shame. I already have Project Supremacy. I guess I’ll miss out on your excellent training once again. Bummer. Sorry about that Tim. But you’ve got a GREAT piece of software! I grabbed the Agency Deal. How do I get your bonuses? Hi Ian – good move. Bonuses are in JVZoo. Just log into your JVZoo buyer account – there’s a link in the JVZoo email. Strange John – Project Supremacy is still for sale and the latest video on this site is loaded up in February 2016.
http://www.projectsupremacy.com – Are you still recommending this plugin version 3 with a price tag of $67 per website? Yes Jan we still recommend it now it is back on the market! Hi John are you recommending Project Supremacy even over Yoast? Brad Project Supremacy and Yoast do different things for us. We use Yoast to configure our site properly for SEO but Project Supremacy for inserting Schema markup. Hope that’s clear! John, I thought that PS had the same SEO features as Yoast? Is there anyway you could do a short video on the differences? I was just planning on using PS over Yoast, since they seem to be essentially the same. Project Supremacy also does Schema – that is it’s main purpose, that Yoast does not have. We use both! Ivan I don’t think they are equivalent at all. I would suggest you follow the modules in SEO Breakthrough (no surprises!) but would recommend you ask the Project Supremacy team for a direct comparison. They are the experts on PS and I wouldn’t want to get it wrong. Where we most recommend PS is for Schema / markup. You are the only guy I have ever been subscribed to who provides free training on a regular basis. Thank you. I always look forward to learning more from you. I actually was at a friend’s house several months back, sleeping on the floor, when I woke up at 5am and took a look at the top sellers on JVZoo. Project Supremacy had a private webinar launch, but had sold so many copies that they jumped up to the bottom of the top sellers list just for that morning. It was something like $250 for a lifetime license. I grabbed it pretty quickly, not fully understanding the significance of it. Thanks Ivan and you are welcome!